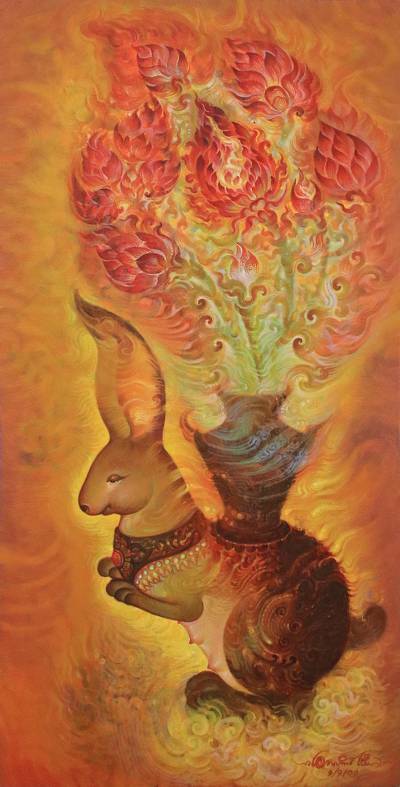 Signed Surrealist Painting of a Floral Rabbit from Thailand, "The Rabbit"
This surreal painting features the image of a jeweled rabbit, carrying on its back a vase filled with lotus flowers, believed by the people of Thailand to represent purity and goodness. Artist Aeknarin Chuanglao paints this composition using warm, sunny colors and spiraling motifs that accentuate the painting's otherworldly aesthetic. You can find 'the Rabbit' (2009) by Aeknarin Chuanglao in paintings categories such as Animal Themed Paintings, Floral Paintings, Surrealist Paintings and Acrylic Paint Paintings. Enjoy exploring these sections for other Novica treasures. "I wish for everyone who owns my work as happy and delightful a life as that of the ancient Lanna culture." "I'm Aeknarin Chuanglao, and my nick name is 'Jeab.' I was born July 10, 1973 in eastern Thailand but my mother and I moved to her home town after my father died. Growing up, I lived with my mother and my grandparents. They loved me so much, because I was the only child in the family. "My father-in-law worked as a government officer, but is now retired. He is very good guy and he always encouraged me to study. I think that even though I lost my father, I'm fortunate that everyone in my family treats me with love and understanding. They give me courage to live. "I know well that I've loved to paint since I was very young. I remember that in school I did quite well in art. After high school, I didn't hesitate to choose art as my major and I decided to teach new generations about the beauty of art, so after graduation I worked as a teacher. For five years, I taught my students with my heart, and always encouraged them to be stronger. And then I came to the conclusion that I had done all I wanted to do for others - now it was time for me. I quit the job in 2002 and became a freelance artist. "I paint with my imagination, with love and I want to paint everything. My life is easy and tranquil with my lovely wife and my dog. My life is perfect because I live with someone and something I love. These are the great strengths of my life. "I appreciate and admire Lanna (northern Thai) culture because I lived with my grandparents in a rural area of northern Thailand and I learned our ancient traditions from them. I believe that you can touch these things through my art, which presents my love for my culture and my surroundings. "I wish for everyone who owns my work as happy and delightful a life as that of the ancient Lanna culture. All of my work is about the belief in good things, and we believe that it will bring only good things for the owner. Art is suitable for everyone around the world, because art is an international language that everyone can understand."